Violence has become a way of life in Kashmir but it is heart-wrenching when innocent kids fall prey to the violence. 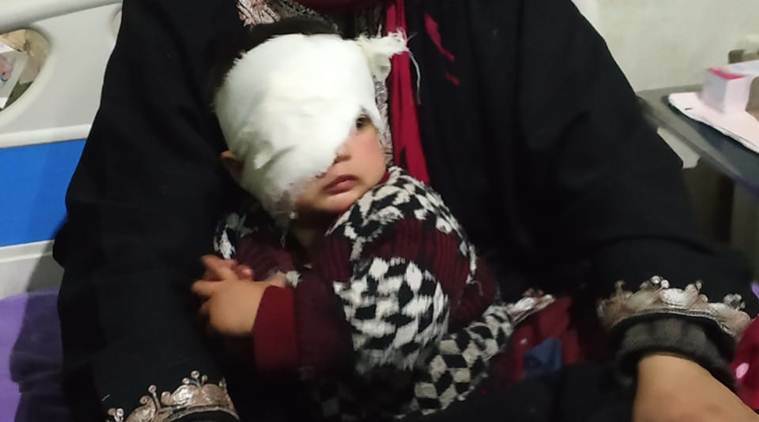 One such victim is 20-month-old Hiba Nisar who has undergone a surgery on her right eye at the Shri Maharaja Hari Singh (SMHS) Hospital in Srinagar. Despite the surgery, doctors are apprehensive that they would not be able to prevent loss of sight in her right eye. Hiba got hit on Sunday inside her home in Kaprin-Batgund area of Shopian in the wake of clashes between security forces and civilians following an encounter on Sunday morning. The clashes resulted in the death of one person with 50 people being injured, reports say. Hiba’s mother Marsala Jan, talking to The Indian Express said that she was forced to go out of her house with her two kids – Hiba and 5-year-old son when he started complaining of breathing trouble after heavy tear gas shelling. The trio was greeted with a hail of pellets from three security personnel the moment they stepped outside. Jan who herself got hit with pellets while trying to save Hiba’s face is now anxious to know about the fate of her son whom she had pushed aside to save him from pellets and the father Nisar Ahmed has been asking relatives back in Shopian to find out whether he is alright or has been hit. According to the doctors at the hospital, Hiba’s condition is critical as she has a perforation in the cornea with pellet in the eye. The anxious parents are praying that not only would Hiba come out of the ordeal unscathed but their son should also be injury free. Only time will tell whether their prayers will be answered. Jan is inconsolable on seeing her little daughter wailing in pain even as visitors and relatives try unsuccessfully to divert her attention with chocolates and other gifts. Jan does not understand as to why her little one should be punished for the folly of others and hopes that God would deliver justice to the family and punish the guilty.